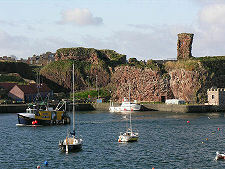 Overlooking Dunbar Harbour are the fragmentary remains of what was once one of the mightiest castles in Scotland. The ruins are in a dangerous and precarious state and access has not been allowed since part of them collapsed into the sea in 1993. This is a castle best viewed from a distance. The best viewpoint is the slope below the leisure centre. From here you can see just how badly undercut some of the remains have been by the sea: it is only a matter of time before there are more collapses. Defences were built on this rocky outcrop by the Votanidi tribe during the Romans' excursions into Scotland (see our Historical Timeline) and it was a Northumbrian stronghold in 650AD. It was later a Pictish fortress until captured by the Scots under Kenneth MacAlpin in 849AD. The first stone castle was probably constructed by the Earl of Dunbar in the 1070s. 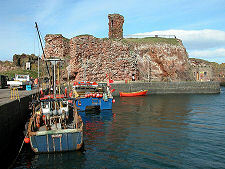 Dunbar Castle was unsuccessfully attacked by the English in 1214, but Edward I had better luck in 1296. And Edward II sheltered at Dunbar Castle after the Battle of Bannockburn in 1314. Following this the castle was slighted, then refortified in 1333. 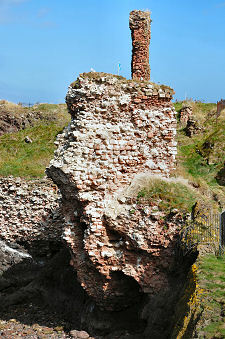 Dunbar Castle's most famous moment came in 1338 when Agnes Randolph of Dunbar, or "Black Agnes", commanded the successful defence of the castle during a five month siege by the English. The castle was rebuilt in the early 1400s, repelling another English siege in 1435 before being badly damaged by them in 1448. In 1488 it was slighted by the Scots to prevent its use by the English. Rebuilding in 1515 was followed by another English attack in 1548, and further fortification, this time by the French, in 1550. 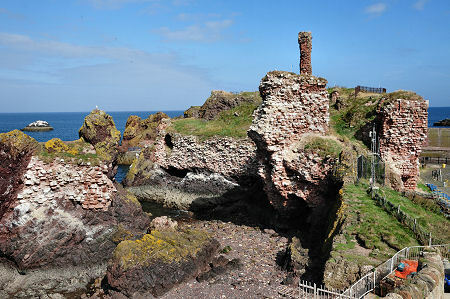 On 24 April 1567 Mary Queen of Scots was brought to Dunbar Castle by the Earl of Bothwell after his abduction of her, and the two later returned to the castle after their marriage on 15 May. After the Queen's subsequent surrender and abdication, the Scottish Parliament ordered the destruction of a castle that was so strong its possession destabilised the balance of power in Scotland. The final indignity for Dunbar Castle came with the construction of the Victoria Harbour in 1844. 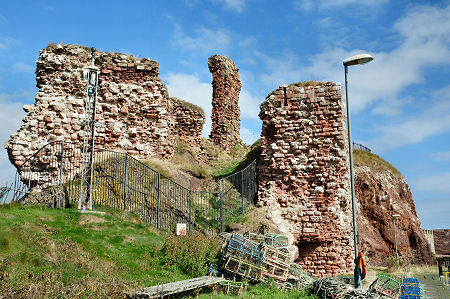 A new entrance for Dunbar's harbours was blasted through the end of the rock on which the castle ruins stood: indeed, the process of firing explosives by electricity was invented especially for the job. Today the only obvious residents of the castle are the Kittiwakes who build nests on the exposed stonework during their breeding season. If you walk round the end of the harbour towards the harbourmaster's office while the colony is active. you soon begin to hear and smell them. Less well known and less spectacular than Dunbar Castle, but much better preserved, is the later battery which lies at the north east corner of the Victoria Harbour. This overlooked and protected the original entrance to Dunbar Harbour and now provides a good viewpoint for the town, harbours and castle. Overlooking Dunbar Harbour and best viewed from the grassy bank near the leisure centre. Access is not allowed: the ruins are in a dangerous state.